Is your payment system secure ? Yes ! 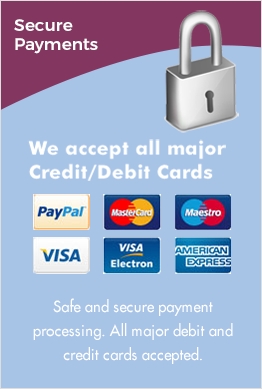 We use SAGEPAY SECURE PAYMENTS to accept credit card payments from all major credit and debit cards using the latest encryption software including 3D SECURE. We also accept PAYPAL. PAYPAL is owned by eBAY and is one of the most trusted internet payment systems. Do you accept Cheques or Postal orders ? Are all your items in stock ? Yes, our items are in 99% of cases in stock. On the rare occasions the items are not in stock we will be in the process of receiving new supplies and the customer will be informed. Most of the time it will state on our site if an item is out of stock. Please note : we are NOT a DROPSHIPPING seller. Dropshipping is where goods are not held in stock by the seller but by a third party. This way of trading can often lead to disappointment for customers in our opinion. We genuinely stock our goods ourselves ! Can we order large amounts of a particular product ? We can occasionally supply large amounts of a particular product, e-mail us for information if you are interested in this service. We can offer a discount on large purchases. Do you have an ebay store ? Yes we do. Our ebay store is listed in our 'links' page. We have over 30,000 postive feedback ratings on ebay. Our ebay shop has many items from our WARSTORE range. We also sell some products that are not available on this website. Contrastingly we also sell items on this site that we wont, or can't sell on ebay. We also sell on Amazon. Where do you get your stock ? We import many items from the U.S.A. but also have many suppliers in the UK. We also purchase on occasion from Pakistan and China. Are you a 'Proper' business ? We are a VAT registered business in the UK. We have been trading as a bonafide business for over 11 years.